Christopher Hamilton (16) was announced as the Runner-Up at this year’s Scottish Solo Championships. 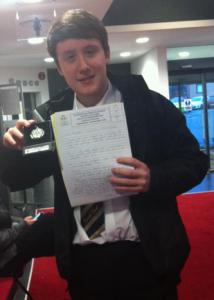 Christopher, who currently sits on the Solo Horn chair with UNISON Kinneil Band, entered in the 16 and under age category in the competition that was held on Saturday 4th February in the Howden Park Centre in Livingston. He chose to play the challenging Horn Solo ‘Silver Threads Amongst the Gold’ by William Rimmer. Christopher adds the Scottish Solo Runner-Up medal to his East of Scotland Winners Medal that he won in September. On Saturday 26th November Kinneil Youth Band met at the Kinneil Band Hall at 7am where a bus was waiting to take them to compete in the Scottish Youth Brass Band Championships at Perth Concert Hall. Taking to the stage at 9am, from a first draw, the Band impressed the Adjudicators: David Childs & Ian Porthouse with a fine selection ranging from the march Blaze Away to The William Tell Overture. The band were awarded a Silver Award for their performance. 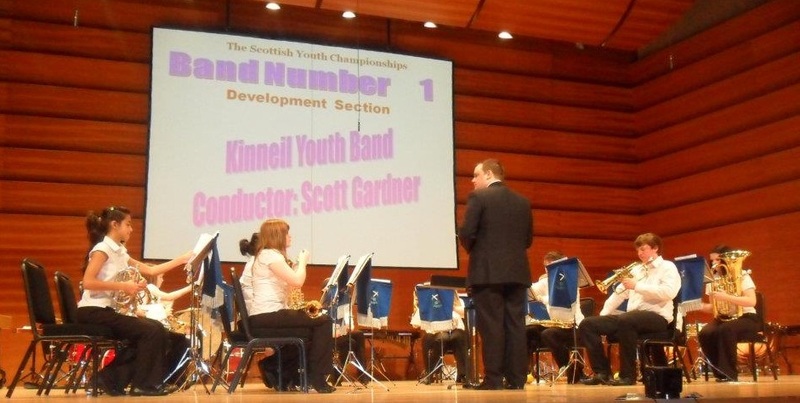 A total of 8 bands from across the whole of Scotland competed in the Development Section for players aged 16 and under. The day, however, wasn’t over as the Youth Band rushed back on the bus and headed for Glasgow. A long standing engagement for UNISON Kinneil Band is to play at the STUC St Andrews Day March which has an Anti Racism theme. Arriving at Glasgow Green just in time for an 11am start, the Youth Band managed to meet up with members of the Senior Kinneil Band. Once formed up the combined Band marched through the centre of Glasgow in very windy and wet conditions. Marching along at the back of the Band were some mothers and a Grandparent of some Youth Band members who came along to lend their support for the day! After about an hour the march arrived at The Glasgow Film Theatre where a rally took place. Everyone from both the Senior and Youth Band were delighted to get back on the bus for Bo’ness wet and tired after such a busy morning. Both the Youth and Senior Band look forward to getting together again on Friday 9th December at 7:30pm in Kinneil Bowling Club for a joint Christmas Concert. Tickets priced £5 are available from Kinneil Bowling Club, Brian Holmes on 822388, Ruth Kelly on 828721or from any Band Member. Christopher Hamilton was crowned the 16 and under East of Scotland Solo Champion on Saturday 12th November. Christopher, who currently sits solo horn with the UNISON Kinneil Band, gave a near flawless rendition of ‘Rhapsody for Eb Soprano Cornet’. The competition was held in the Scottish Mining Museum at Newtongrange. Christopher also shared success with the 16 and under Quartet Ensemble that were placed 2nd at the same contest. Christopher was joined in the quartet by his twin sister Joanne (1st Cornet), Jennifer Wood (2nd Cornet) and Calum Middleton (Euphonium). The quartet played George Bizet’s ‘Farandole’, the hymn tune ‘Vox Electi’ (I Heard the Voice of Jesus Say…) and Handels ‘Hallelujah!’. The quartet and Christopher will now both represent Kinneil at the Scottish Solo and Ensemble Finals held at the Howden Park Centre, Livingston in February. Congratulations and best of luck for all of you in the finals! UNISON Kinneil Band would also like to congratulate Fiona and Paul Drury on the birth of Beth Joy. Weighing in at a very healthy 8lbs 12oz and born on 8th November 2011 – we can’t wait to see her for her first band rehearsal! UNISON Kinneil Band conducted by Paul Drury, just missed out on a podium position after gaining a very credible 4th place at the Fife Charities Contest last weekend. Another early number four draw meant the band had to warm up in the Bandhall at a very early 07:45am on the contest morning! This didn’t seem to faze anyone at Kinneil – as the band gave a stylish rendition of the legendary Michael Ball test piece – ‘Whitsun Wakes’. The adjudicator for the day, John Doyle, also placed the band 3rd in the March Competition and 7th in the Hymn Tune Contest where the band played ‘Viva Birkenshaw’ and ‘Prelude – From Earth’s Confusion’ respectively. A busy few months are planned at Kinneil – some of the events we have organised include – A Halloween Themed Social Evening, a joint Christmas Concert with the Kinneil Youth Band and some Carolling before the all important Scottish Championships that take place next March. UNISON Kinneil Band were placed in second position at the Brass in the Park competition held at the Scottish Mining Museum in Newtongrange last Saturday 10th September 2011. The band, led by conductor Paul Drury, gave an exciting, but powerful performance of the famous Rimmer march ‘Viva Birkinshaw’ which was followed by some beautiful lyrical hymn tune playing during ‘From Earth’s Confusion.’ Kinneil were placed second from a field of fourteen top quality Scottish bands by the adjudicator for the day, Stan Lippeat. Lauren Robb, Solo Cornet player with the Unison Kinneil Band won the Slow Melody competition which was also held on Saturday. Lauren gave a flawless rendition of ‘Mid all the Traffic’ and was rewarded with a four point winning margin over the nearest of her twenty competitors. Great results must always come in Three’s and the Kinneil Youth Band was delighted with the Gold Award which they achieved at their debut competition. The Youth Band performed in the Development Contest which is for players aged 16 and under. Performing a programme which contained diverse music such as Bohemian Rhapsody, Your Raise Me Up, The William Tell Overture and a march – Blaze Away, the Youth Band achieved second place overall in their age group. Adjudicator Peter Roberts commented that the Kinneil Youth Band gave a performance of ‘great musical maturity which was a delight to hear’. Youth Band conductor Scott Gardner commented ‘I couldn’t have asked for a better performance from the band, the kids were brilliant and they deserve all the credit they receive after putting in so much hard work and effort over the last few weeks’. Every child that plays with Kinneil Youth Band receives free tuition and instrumentation and the band is always looking out for new recruits. If any child is interested in learning a brass instrument then why don’t you come along to one of rehearsals? 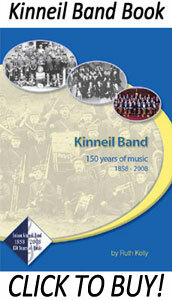 We practise on Monday and Thursday evening from 6pm – 7pm in Kinneil Band Hall on Linlithgow Road. Alternatively just contact Scott Gardner via email (scottwilliamgardner@gmail.com) or phone (07584 048594). The band travelled to the seaside resort of Troon on Saturday 20th August to compete in the 2011 Land of Burns Contest which was hosted by the Dalmellington Band. 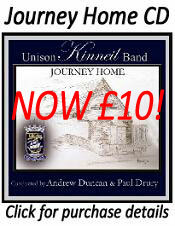 UNISON Kinneil Band was placed in 8th place with 180 points after a fine performance from the dreaded number 1 draw. Unfortunately, the performance which featured some delightful sounds, did not find favour with adjudicator Kevin Wadsworth. The band’s next contest appearance will be at the Brass in the Park competition in Newtongrange on Saturday 10th September 2011. UNISON Kinneil Band travelled to the seaside resort of Blackpool to compete once again at the Spring Festival Competition. The set test piece for this year’s Senior Cup was Peter Graham’s ‘Prisms’. Under the direction of Paul Drury, Kinneil were rather unfortunate to get an early number six draw from a field of twenty top class bands from around the UK and Ireland. The band produced some mesmerising sounds, but the early draw didn’t do the band any favours. Kinneil had to be content with the 10th place awarded by adjudication team of Derek Broadbent and David Robert in the end, but the result means the band will be back in the Senior Cup Competition next year. Unison Kinneil Band conducted by Colin MacKenzie was unfortunately placed 9th at the recent Scottish Championships held in Perth Concert Hall on Sunday 27th February. Many members of the band and supporters who were in the hall felt the band played very well with some outstanding solo contributions, but the performance did not find favour with the two adjudicators; Stan Lippeat and Lt. Col Graham Jones. The band will now focus on the Annual Concert which will be held on Friday 1st April at 7:30pm in Bo’ness Town Hall and the Spring Festival Competition which is held in Blackpool’s Winter Garden on Saturday 14th May. Unison Kinneil Band was placed 3rd in the recent Fife Charities Open Contest. The competition involves each participating band playing an own choice Test Piece, Hymn Tune and March. 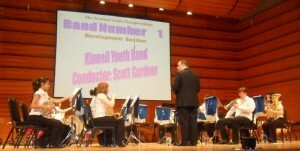 Kinneil Band welcomed back conductor Colin McKenzie for the competition which was held in Kirkcaldy’s Adam Smith Theatre. An early third draw meant Kinneil took to take to the stage at 11am. The programme consisted of the March “Star Lake”, the Hymn Tune “Amazing Grace” and the Test Piece “Elgar Variations”. Along with the open result of 3rd place, the band’s Principal Euphonium player, Ian Campbell, was awarded the Best Euphonium prize. On Saturday 11th September Unison Kinneil Band took part, for the first time, in the “Brass In The Park Music Festival” held at the Scottish Mining Museum in Newtongrange. The event which takes place over the whole weekend is organised by Newtongrange Band. The band competed in the March and Hymn Tune contest playing the march “Knight Templar” by George Allen followed by “Swedish Folk Song (O Lord My God)”arranged by Peter Graham. Despite an early draw which saw the band take to the stage at 10:45am conductor Paul Drury led the band to two very good performances. Adjudicator Tony Swainson placed the band in second place behind the winners Whitburn Band. This year also saw the introduction of a Slow Melody contest for Soloists. The band had entrants in both Youth and Open sections and our congratulations go to Christopher Hamilton (Tenor Horn) who won the Youth event and Lauren Robb (Cornet) who was runner-up in the Open event.